The German based research institute, the Fraunhofer Institute for Organic Electronics, Electron Beam and Plasma Technology, has developed OLED elements that can be integrated into textile. The development will be presented at the Electronics System Integration Technology Conference (ESTC) 2018 from September 18 – 21, 2018 in Dresden, Germany. Fraunhofer has developed button-sized OLED elements to showcase a possible approach of OLED integration on textile. The OLED element, named “O-button,” combines a wafer-thin foil-based OLED with a microcontroller on a conventional circuit board. Attached to conductive yarn on the textile, the OLED button is dimmable with supplied or controlled power with two-color-variable variants available. According to Fraunhofer, it created the button shape OLED to show designers an idea of how OLED elements can be applied on textile. However, there are almost no limits to the structuring of OLEDs. Thus, they can be further applied in new innovative designs. Fraunhofer said the scientists have tackled the challenges of washablity and recycling and are collaborating with designers in the fashion industry. It is expected that the first OLED embedded design will be in the market in about three years. Jan Hesse, OLED design and integration specialist in the field of flexible organic electronics at Fraunhofer FEP, noted that the integration of OLED in clothing does not serve only for fashion designs; it also creates functional benefits such as increasing visibility to enhance safety. Furthermore, as OLEDs can be adapted to specific wavelengths, medical or other special applications will be conceivable. 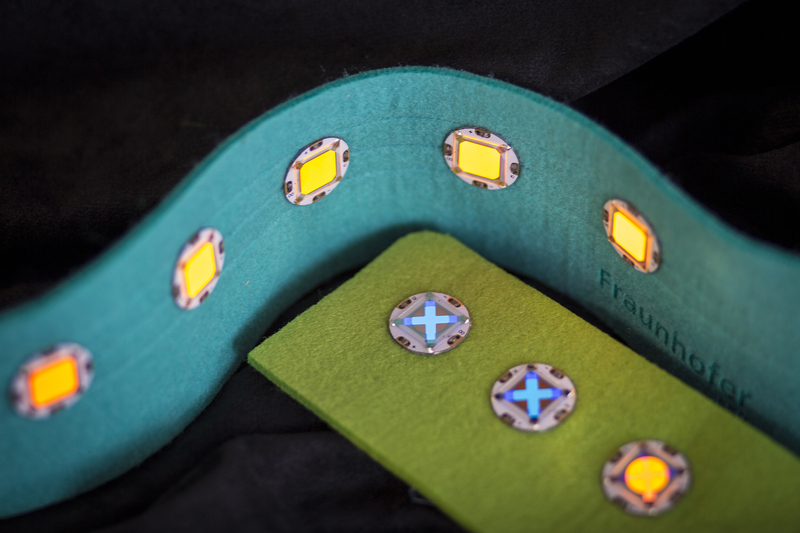 Prior to the development of the integration of OLED and textile, MIT has announced its achievement of producing LED embedded fabrics which can transmit optical signals. The commercialized applications of the LED fabrics are expected in 2019.